Every day I'm convinced that I am failing either in my parenting or in my professional life, sometimes both. Either I yelled too much that day or I didn't get all my work done, something always goes wrong in my mind. I've decided that perhaps that's not a bad thing. You see when I bake cookies I don't worry about how they'll turn out. I read the list of ingredients and make sure I have everything to make them. I follow the directions exactly and hope for the best. Sometimes they don't turn out great but I don't really care. They're just cookie. No big deal. My kids didn't come with directions. And how they turn out is a big deal. The most important job I have is raising my kids. That's why I worry when I make a mistake. The stakes are high. My professional life is fun and difficult at the same time. It's difficult finding work as a freelancer. Not to mention time consuming and defeating when you hear no too many times in a row. Thankfully I love it and my skin is getting thicker every week. Being a mother is hard. It's the most intense on the job training you'll ever go through. People talk about the mommy wars and they are real and ridiculous in my opinion. 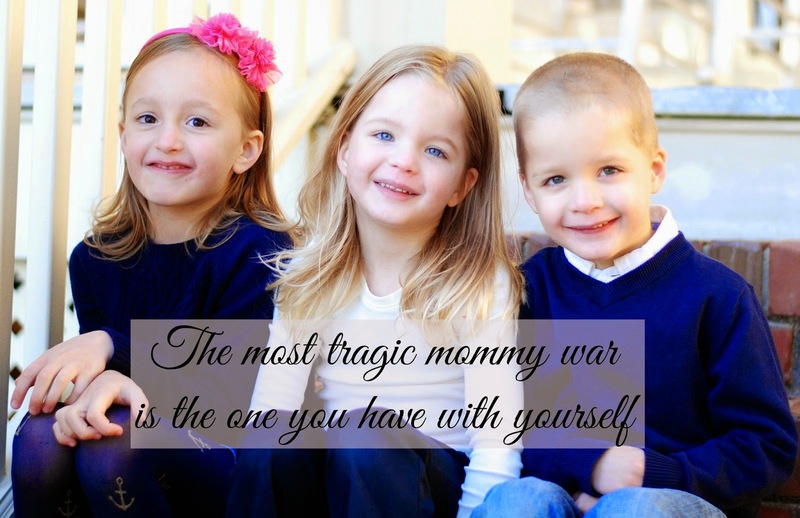 But the most tragic mommy war is the one that we have with our self. When we spend too much time focusing on the fact that we are failing we are at war with our self. I yell too much, I'm failing at having patience. I'm failing at getting my oldest to eat a variety of foods, what if she never eats meat that isn't processed? This weekend I took my kids to a book fair, epic failure they went in three directions and we ended up leaving shortly after arriving. I was turned down by a magazine for a free lance piece...again. I didn't get that blogging opportunity I wanted. My laundry is so backed up that Molly was out of clean jeans today and Mark is wearing his sister’s socks. On and on the list goes. Do those failure diminish my value as a person or mother? Or are they just signs of my imperfection? It's OK that we feel bad when we mess up. Feeling bad shows how much we care and that we want to do better. I try many things with my kids and some are gigantic failures. I'm constantly going after something professionally that doesn't go through. Hearing someone say no to hire me is a regular occurrence in my life. Failing doesn't make us bad mothers or women. Failing shows our courage, the courage to try something new and dare that our lives could be better. Success will never come if we aren't brave enough to put ourselves in the position to fail. We know it's worth it. I so get this. I always feel like I should be doing something better. Me too. I wonder why we think that way? thank you for this post. Needed it for more than just motherhood! Agree, it applies to more areas of motherhood. Oh I so get this! I keep feeling like a failure because I'm not patient enough or I yelled .